I love to create cards and scrapbook layouts. I never thought I was a creative person, but I have found that if you work away it, creativity grows. When I first started stamping, I would not send any of the cards I made! (sound familiar??) I needed to keep them to copy for future cards. In the stamping world we love to CASE (create and share everything), so I had to keep my cards to CASE them!! I also searched other forums and websites for ideas and projects to CASE. As you do this, you start to become creative. You like the look of a card, but don't have that stamp. No problem, substitute on of your own. Not keen on the colour? Change it to something you love. As you make these changes, you start to develop your own creativity. Over time you will find inspiration for cards all over the place. 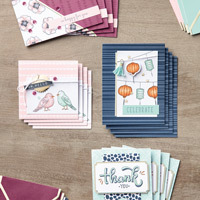 Something you see while going through your day - a beautiful sunset, or a tree blowing in the breeze can inspire colour combinations, or spark an idea for a card layout. Nature is beautiful, and very inspiring. So go ahead and CASE my cards, swapping out bits and pieces to make it your own beautiful creation. Having said all that, sometimes it is nice to just follow the lead of someone else, and that is why card classes are so much fun. When you come to my classes, you can make your card exactly as I did, and just enjoy the crafting time without a lot of design time. That is also why kits can be so much fun. 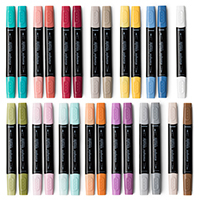 The Colour Me Happy Bundle is a great way to enjoy lots of crafting, with minimal design effort!! The bundle includes the Colour Me Happy stamp set, and Colour Me Happy project kit. Together you have what you need to make 16 (or more) beautiful cards. This bundle is designed to work with our fantastic Stampin' Blends, but you can colour the images any way you like. I made these cards following the directions in the kit, but you can also use the images and pieces to create your own unique cards. Whatever you choose, the crafting will be fun, and the results will be beautiful. Happy Stamping!